This section of the website discusses how you actually go about getting an e-Lybra system for yourself. We normally recommend that we give you a demonstration so that you can be sure of what you are buying. We discuss here how to contact us, what you need to know, and also what you will actually get for your money. How to Buy a New e-Lybra 9 SystemArranging a demonstration, pricing and payment, training and support. Contact Request FormA simple form to contact us with - you can ask us questions or ask to arrange a demonstration. e-Lybra System: What you get for your moneyA specific list of items that explains what you can expect to find "in the box" when you buy a system. 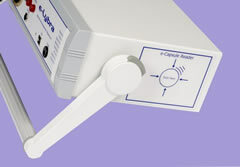 Buying a Pre-Owned e-Lybra 8 SystemWe also keep a small stock of reconditioned e-Lybra 8 units. I love my e-Lybra! Uses for the e-Lybra are limitless and I am constantly coming up with new ideas and uses for it. My clients are amazed how accurate it is in picking up their information. My main area is working with emotions. The clients experiences are that they have more energy, and feel more empowered. They also feel reassured by wearing the e-pendant as it supports them through their changes.